Powerstock Cider Festival - West Milton Cider Co. The first ever Festival was held at Powerstock Hut in November 2001. This was in response to a call to arms when the village hall had just been rebuilt and was totally bereft of funds. Having held a very successful tasting evening at the West Milton cider shed in the winter of 2000 I suggested we could try and expand the idea a bit and incorporate a food fair with a cider tasting. That first year was surprisingly successful with about £500 raised for the Hut. It had been quite difficult finding anyone else in Dorset who was actually making cider at that time and we were grateful for the support of Bridge Farm cider who agreed to bring reserve supplies if we ran low. 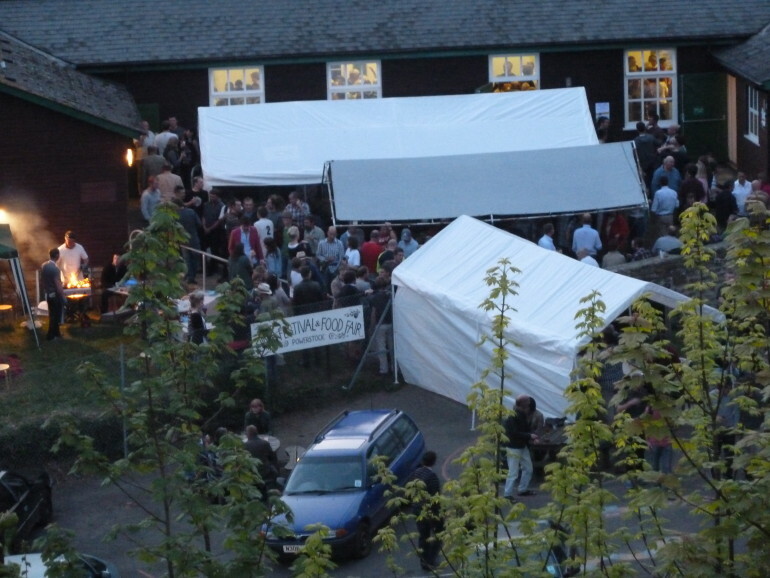 Chideock Cider Club were the main contributors on that first evening along with the West Milton Club, Norman Purchase and Simon Mehigan both of Netherbury. A total of 30 gallons was drunk that evening and everyone departed in a very buoyant mood unaware they had just witnessed the rebirth of cider making in Dorset. That may be quite a bold claim but Powerstock was certainly the only cider festival around in Dorset at that time and it did have quite a major influence in regenerating public interest in traditional cider drinking and the making of it. In 2006 the festival was awarded the prestigious innovation award from the Royal Bath and West show in recognition of it’s success in promoting cider. Over the years the food festival was dropped to make way for more and more cider makers, most notably from the ever growing numbers in Dorset and even attracted makers from as far as Yorkshire and Scotland, all keen to be part of this renaissance of traditional cider. Eventually public attendance started to outgrow the Hut facilities but rather than try and replicate the event in a larger venue we decided to keep it at Powerstock and limit numbers to 500, which we control by advanced ticket sales only. These days we see at least 120 gallons consumed during the course of the evening – all in small beakers! Currently there is a regular attendance of about two dozen cidermakers, many of whom have been coming since the early years. During the afternoon a competition is held for the best farmhouse cider, then once the doors are open to the public each cider maker stands with his cider and offers tastes to the enthusiastic drinkers. A taste – one third of a pint – has been 50p since the beginning, and this with the entrance money is how funds are raised during the evening. There is always plenty of food and live music and soft drinks for the drivers. Over the course of the years the event has raised over £40,000 the annual proceeds are now divided between the Hut, the Air Ambulance and many other smaller charities. The festival was moved to the spring in 2004 and now has a permanent fixture on the last Saturday of April every year. Go on – give it a try, you know you want to! !